Mary Riter Hamilton. 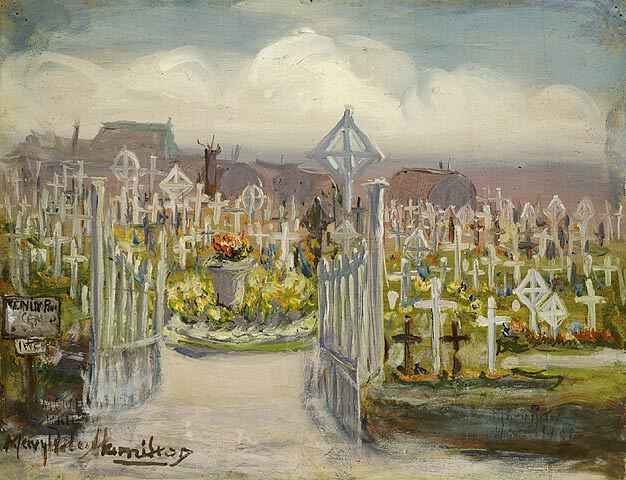 Menin Road, British Cemetery, oil on paper, c1920. Library and Archives Canada, Acc. No. 1988-180-110. Library and Archives Canada holds just over 200 paintings, on plywood and cardboard, by the Canadian artist Mary Riter Hamilton. A long-time professional artist, Riter Hamilton had supported herself since the age of 22 after the death of her husband, Charles W. Hamilton, by the sale of her art and commissions. Riter Hamilton had studied in Europe before having to return to Canada to care for her ailing mother, and at the outbreak of the war in 1914 was living in Victoria, BC. As a war artist, Riter Hamilton occupies an interesting space in the genre. She campaigned throughout the war to be allowed to go to France to paint the Western Front, but was not permitted to until 1919, when a private sponsor commissioned her to go to France in behalf of The Amputation Club of British Columbia. Unlike the artists sent by Lord Beaverbrook as part of the Canadian War Memorials Fund, Riter Hamilton was not a soldier, nor did she have first had experience of the war. Her representation of the war was rather the landscapes and people left behind, after the conflict had ceased. Like the landscapes painted by A.Y. Jackson and F.H. Varley, these were also transitory, the last views of the Great War before the reconstruction that has rendered northern France the mostly smooth, green surface that we know today. The villages that Riter Hamilton painted have been rebuilt as they were before the war, and the graveyards condensed into the neatly organised central places that we can visit today. She painted over 300 works while living in a series of tin huts on the front, first with the remainders of the Canadian Corps that served in France until 1919, then with the Chinese larbourers hired by the British government to clean up the mess left behind by 4 years of industrial warfare. These small paintings depict the return of everyday life to the front, the re-growth of grass and trees, and the softening of the harsh lines left by the millions of shells that churned the landscape. They are also very melancholy. For the most part, Riter Hamilton’s paintings are sparsely populated, with people represented as the number of crosses for the dead rather than the living. For a place that saw the lives and deaths of millions of soldiers, civilians and animals, it is a curiously empty landscape; the crossroads abandoned and the fields littered with the wreckage of tanks and dugouts. Mary Riter Hamilton stayed in Europe for three years, painting furiously. Her work was exhibited in London and through The Amputation Club of British Columbia in the early 1920s,with some of the pieces were sold to raise money for veterans. Riter Hamilton donated the remainder, 227 in all, to what was then the Canadian Public archives in 1926. She died in relative obscurity in 1954 in Vancouver and was buried beside her husband William in Port Arthur, Ontario. Her work is commemorated and studied extensively today at the Modern Literature & Culture Research Centre at Ryerson University in Toronto. I did not know about the work at MLC. Hamilton’s paintings are haunting. According to Library and Archives Canada, “Hamilton refused to sell any of her battlefield paintings, choosing instead to donate the canvases to the National Archives. She wanted them to remain in the hands of all Canadians for the benefit of war veterans and their descendants.” Maria Tippett tells a different story in By a Lady: “Unable to find a purchaser for her collection, she presented it to the National Archives of Canada in 1926.” Which do you suppose is true: wouldn’t sell or couldn’t sell? Regardless, they are a treasure on the LAC website … if only they would mount an exhibit.